It’s Teachers’ Day today! Facebook asked me to thank my favorite teacher. I decided I had more to say. I had the incredible privilege of being homeschooled all the way through high school graduation. It is forever a part of what makes me who I am, and will always be something I talk people’s ears off about. 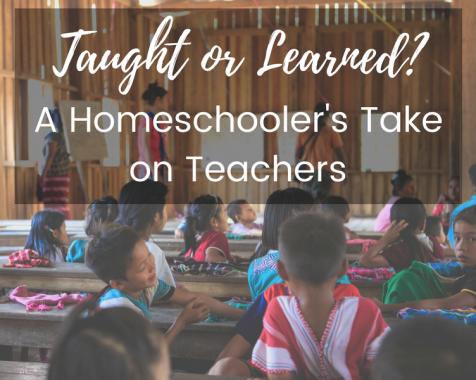 One of the best gifts my mom, though homeschooling, gave me was the ability to teach myself. I learned to follow written directions and work independently from a young age. My level of responsibility for myself and my education increased as I progressed. When I didn’t understand, I learned to find another explanation. Growing up in the technology age, I learned to use Google to its full potential for assistance in my education. There were no exam answers to look up, so I didn’t build a habit of cheating. Instead, I learned how to reword my problems into search queries. I learned how to write and format essays by perusing the Purdue OWL website. I refreshed my memory on key grammar concepts by reading blog posts that gave memorable examples. When I wanted to learn something new–like knitting, sewing in a zipper, or video editing–I found YouTube videos. Whatever wasn’t covered, I figured out by myself. I’m grateful for the years of experience I gained in managing my time and taking responsibility for my own learning. I definitely haven’t perfected these skills yet, but they have been immensely useful in my college journey so far. However, there was one unfortunate (and unintended) result of this education experience: For a while I thought that because I was so good at teaching myself, I didn’t need any teachers. I thought I had nothing to gain from having a teacher. I equated the deficiencies of classroom learning with teachers in general. “They can’t teach at the right level or speed for everyone,” I complained. “It’s either too much or not enough. It’s so ineffective for the individual.” I often failed to recognize that this is the curse of tradeoffs in a classroom full of kids, not a failure on the part of the teacher. 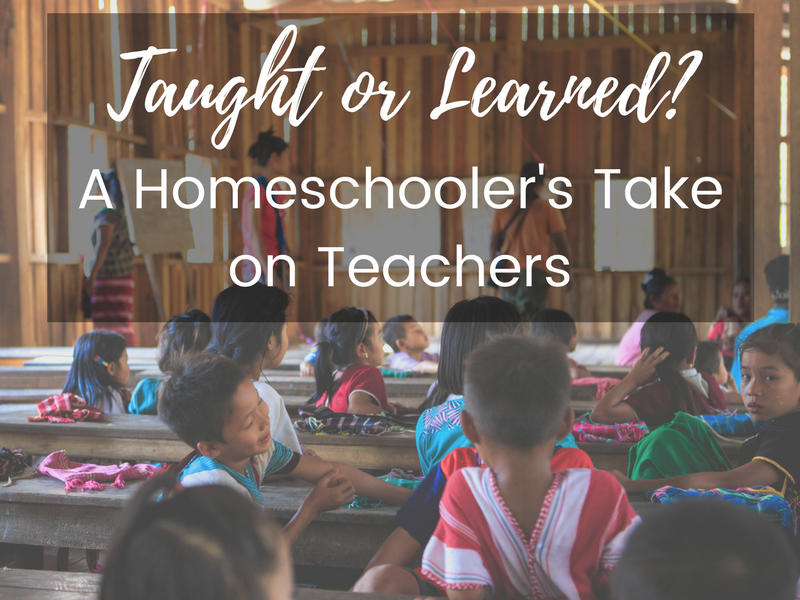 Thankfully, through wonderful teachers at church and in my homeschool group, I began to better value the wealth of experience and vitality a teacher brings to the table. Although my curious self can ask Google her extra questions, a teacher can inspire new questions I wouldn’t have thought of on my own. While I can read an article from an expert, that doesn’t even begin to compare with sitting down and talking to one who knows me personally. Even though I’ve learned to check and evaluate my own work, a teacher can provide valuable feedback beyond what I’m capable of seeing. When I had to make my college decision, one of the options I had was doing my degree online. I would’ve taken some self-study online courses, studied for and taken a lot of CLEP tests, and had a few online courses direct from universities. I would’ve been good at it. I was good at it, for the most part–I did my entire first year’s worth of credits this way, and it was a huge blessing. But I wanted to go to traditional college. Not because I wanted the “college experience,” necessarily. I certainly didn’t want to party, and I didn’t want to get involved in sports or clubs, really. And I didn’t even end up living on campus. What’s left? Last week I officially finished my first year at the University of South Florida. It was an enormous growing experience for me, and the seven wonderful instructors I had were a huge part of that. Because of my professors, I fell in love with linguistics and survived College Algebra. I realized I am a public speaker–and most of all a communicator. I learned to see effects of the spread of English around the world, and what my place in that as a teacher might look like. I learned that “the other side” isn’t a villain, and sometimes understanding people is crucial to understanding the facts. I learned that talking to professors outside of class is an incredible privilege, and one I should make use of frequently. Teaching isn’t an easy job. I know this at least partially through first-hand experience. But teachers keep the world running, and they make a huge difference in the lives of all they encounter. I am so grateful for the many teachers that have impacted my life in one way or another. I hope that as I continue to teach in various situations, the kind of teacher I am will be shaped by them. To all the teachers out there: Thank you for what you do.